Wash the peanuts using a colander. Place the peanuts in a large stock pot (10 - 12-gallon size). Fill the pot with enough water to cover the peanuts. Stir to distribute the salt. Heat to boiling over high heat. Remove a few peanuts, shell and taste, checking both the texture and the level of saltiness. If you prefer your peanuts to be saltier, add more salt at this point. If you like your boiled peanuts to be fairly firm, they may be ready at this point. If so, remove from heat. If you prefer them to be softer, you may need to continue boiling for up to two more hours. If you go with this option, check the texture every two minutes or so until they are to your liking. When they are the proper texture and have the right amount of saltiness, remove from heat and drain. Tip: Make note of the time/saltiness variations so you can make any adjustments at the outset the next time you prepare boiled peanuts. Cajun boiled peanuts: Replace 1/2 cup of salt with Creole seasonings, such as Tony Chachere's or Zatarain's, and stir in 5 to 8 tablespoons of liquid crab boil when you add the water. Garlic boiled peanuts: Add 6 to 8 garlic cloves (or the equivalent amount of dried garlic) to the pot before cooking. 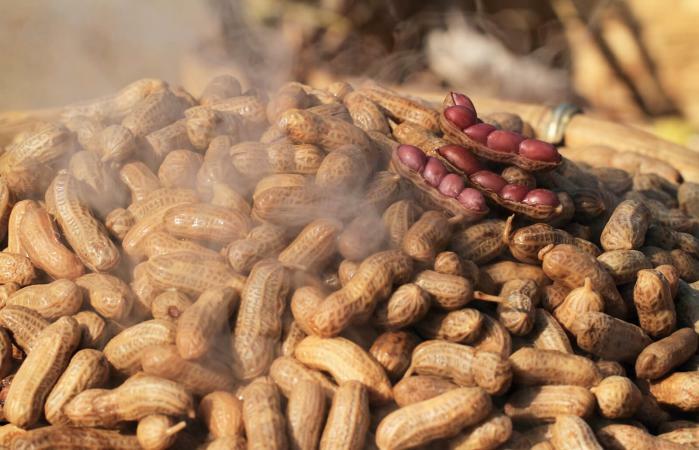 Beer boiled peanuts: Pour one or two, 12-ounce bottles or cans of your favorite beer into the pot before covering the peanuts with water. Ham-flavored boiled peanuts: Follow the basic recipe, but place one or two ham bones or ham hocks in the pot before adding the peanuts and other ingredients. Boiled peanuts taste great hot or cold. You can eat them as soon as they reach the texture you prefer and they're drained. You can also chill them before eating. Either way, store any uneaten peanuts in the refrigerator for future snacks. They will keep in the refrigerator for one week. You can also store them in the freezer for a few months. If you do this, freeze them in snack-size quantities so you can thaw the right amount when you are ready to munch on some yummy boiled peanuts.